Findlay Bottle Show - Findlay Bottle Club - Ohio - Antique Bottles: Sample 1-Way WWII Dates Amber Glass Beer Bottle -- Rare? I rec'd this email today, and thought I'd share it, and my response, and ask for any info you knowledgable bottle collectors can add -- please! "I have an old World War II beer bottle. It is a small brown bottle. I am told that it was made for soldiers overseas after the war. It is a no deposit-no return bottle. The interesting thing about this beer bottle is that it lists all important events of the war beginning with Pearl Harbor 12/7/41 through end of hostilities 12/31/46. At the bottom edge it has ships and planes bombing each other and it has the atom bomb explosion going up the middle of the bottle. Owens Illinois Glass Mfg. in Toledo OH made the bottle. On the bottom it is dated 6/09/47 Duraglas 1 Way. I tried to give the bottle to the Smithsonian Institute and had several emails from them and then heard nothing further. I also contacted the Historical Bottlers Collectors in New Jersey but never heard from them. I would like to know if the bottle has any money value and I would also like to find a home for it - someone who would really appreciate its historical value. Can you help me? I await your response." Hi Carole -- Thanks for writing. I am sorry to disappoint, but I do not think that you have a scarce bottle. I did a google search, and an eBay search, and while I could not find any definitive info, I can surmise that they do not bring a strong price. This shows you the low prices they brought. It also shows you some terminology they used -- no-deposit bottles are also called "1-way" (I've also heard "throw-aways" used). I would suggest watching ebay to see when some more come up -- summer is the slowest time on ebay, fyi. Thanks for sharing -- wish I had better news!" If any readers out there have some definitive info about Carol's bottle, please leave a comment here! Well, I was right that there would be a dealer at our club's October bottle show who would have something to say about Carol's interesting bottle. There was one of these 1-Way War Dates bottles on a dealer's table. The dealer didn't know anything about the bottle, other than it was interesting to him, and since he doesn't do eBay, it was not common to him, so he had it priced at $40 (it did not sell that day). 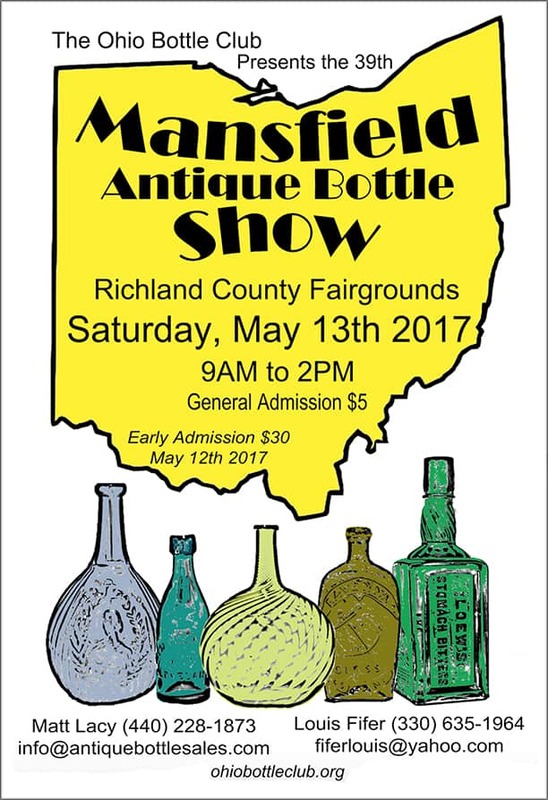 I was looking at the bottle, when another dealer at the show came up to me. Bob Davidson, who is a long-time bottle dealer (he goes by bottlbob on eBay -- check out his listings for quality bottles from someone you can trust), reported that he had sold one of these same bottles before, and didn't think they were common, either. He said he had sold his for $50, a while ago. Bob was of the thought that they were samples, made to present the then-new concept of 1-way disposable bottles, and that they had never been ordered to be used/filled with beer. That would explain why the ones that are around were saved -- they were a novelty to the receiver, and they were not used, so they remain in excellent condition. So, while these 2 gents were of the opinion that they were worth more than my estimate, they didn't price them too terribly high because they are still modern bottles. I stand by my first report, that they are "available", listed very often on eBay, but not seen at every bottle show, so you might be able to find a buyer that will pay a better price in person. As I write this, there is currently one available on ebay - languishing with a Buy-It-Now price of $34.99 (here's the link: WW2 IMPORTANT DATES 1-WAY BEER BOTTLE . You can see by the pix that it is an interesting bottle, and maybe this discussion will raise awareness of it, and drive the value up. I'm reading: Sample 1-Way WWII Dates Amber Glass Beer Bottle -- Rare?Tweet this! Thanks for telling us -- we'll be interested to see if your bottle sells. FYI, I just looked, but your ad did not have any photos. Photos are on the listing now, sorry for the delay. Notice the bottle is sitting on my fathers U.S. Navy Torpedo book, he served at Peral Harbor during WWII. My wife got this bottle from an Aunt that worked at the Libbey Owens Ford glass factory in Charleston, WV; she speculates that it was made there. The plant was torn down in the early 1980's and a mall / theater complex built in its place. The theater was torn down and a state government building built in its place. I can still find softball size chunks of blue / green glass around the grounds. Hi -- thanks for the added info. If anyone researches this bottle in the future, they will likely find this thread, and see that there is some interest, so I predict price and desirability will eventually increase -- perhaps not before your listing expires, though. But, hey, it's not always about the money. I know that you like the bottle too -- perhaps keeping it with your Dad's book and WWII memorabilia would be a good thing to do. Again -- thanks for reading and contributing. by the U.S. ARMY during W.W.2 . As they were building the Alaska Highway.I found dozons of these bottles! Owens-Illnois Duraglas & Anchor-Hocking Bottle marks. They look EXACTLY like the one you picture. All amber glass. 6 green ones- made in CANADA, and only one clear glass- " Ball " is the bottle mark. Other bottles found point to the 1940's found in the same pits...ink wells, aftershave, medicine bottles ! and size. These had no white writing. Just embossed with the words; " NO RETURN NO DEPOSIT " " NOT TO BE REFILLED ". Around the shoulder. I have a bottle like the one pictured in the beginning of these posts. It's been in my family for as long as I can remember (I'm 62). The Society for Historical Archaeology web site indicates that the codes on the bottom shows that the bottle was made in Oakland, CA in 1947. This was where my family lived at that time. My mother always thought the bottle was special so that was why it was saved. Hello, while on a recent vacation to the Island of Saipan north of Guam, I came acrose many of these bottles, also clear glass bottles, in the jungle and caves but without the graphics on it. I even found a larger sized one 750ml bottle with the same shape and "no return no deposit" "not to be refilled" cast into the glass. Im trying to do research on these and find out more info on them as well. The bottle you have looks almost like a commemorative bottle sold after the war. So these bottles were defiently sent to the war in the pacific for soldiers to drink, pretty unique bottles. It's great that you found some interesting bottles. I am not clear by your comment on whether or not you found the same bottle that we're talking about here -- we are talking about the bottles that have the WWII dates/graphics printed on them. The printing is what makes them valuable and interesting to collectors. Modern era plain bottles, with no painted labeling, just the embossed No Return, etc. are, sadly, of no real interest to anyone. Bottles have to have more going for them -- for example, with paper or painted or embossed labels naming specific brands or towns; or be antique hand blown bottles, flasks, figurals, especially in certain rare sizes, colors or shapes. So if you found these painted WWII dates label bottles that were actually sold/shipped overseas, that's very interesting. If you found plain unlabeled bottles, even though they are the same shape, that's a whole other animal.